You are browsing the Blog for Peregrines at 250 Canal St..
June 13, 2013 in Peregrines at 250 Canal St. The Peregrine fledlings continue to be very active around the area and spend lots of time executing new flight patterns as well as lots of time loafing around in between meals. They were observed under heavy overcast skies on the rooftop of a nearby brick building! Peregrines: last chick (93/AD) fledges on Sunday!! 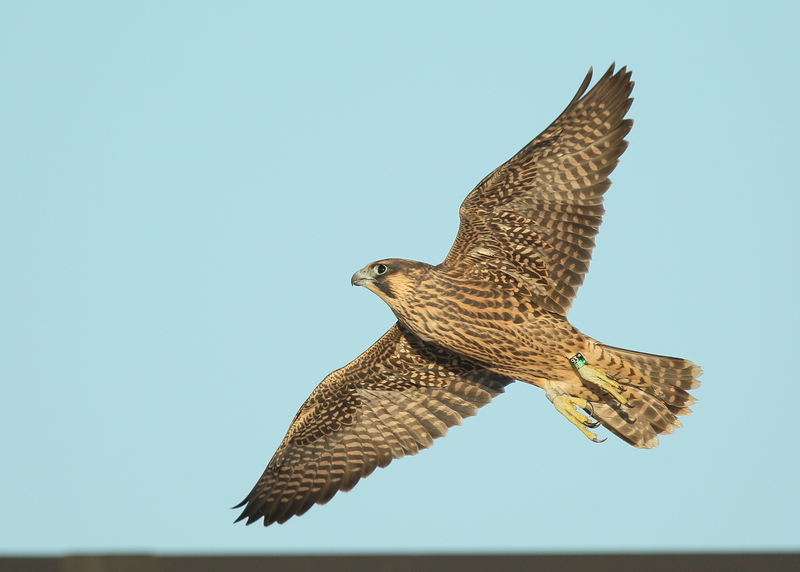 June 9, 2013 in Peregrines at 250 Canal St.
Sunday was an amazing day with the blessing of being able to watch the fledglings just after sunrise and just prior to sunset in brilliant sunlight. The Sunday night watch provided some of the most exciting and breath taking action I’ve ever seen in the bird world! After tracking this 12 year old pair since September 2011, they have become quite familiar. At the last moment this year, they changed nest locations to the north side of the Merrimack River and moved into a tiny studio apartment to lay eggs. After hatching, Mass Wildlife alertly assessed living condtions and moved the 4 chicks to an open air rooftop nest box with terrific success. Tonight was the golden moment that comes every once in while….a moutaintop experience…..one of those moments which glowed, which filled me with overwhelming feelings of unity with creation! Tonight also included the treat of seeing the first flight of the last fledgling!! 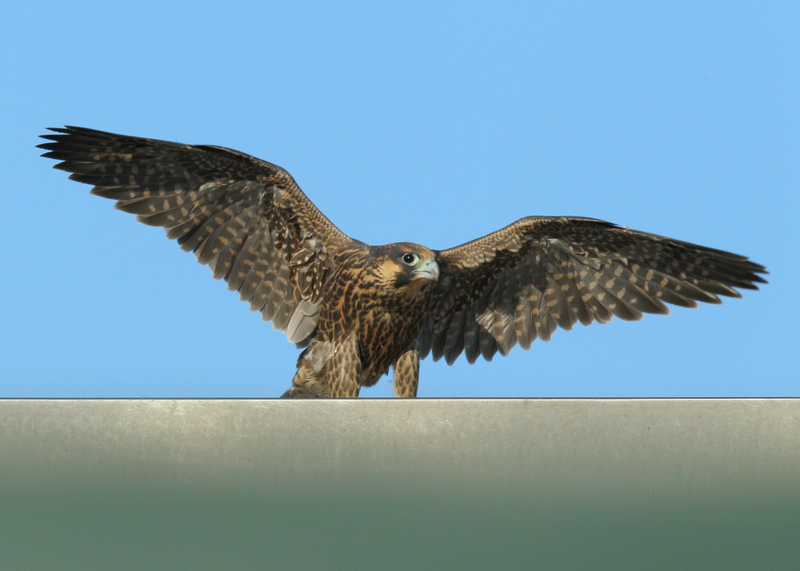 37 photos posted of the peregrine chicks, post fledge, and still trying out their new wings while on rooftop perches, perching with Mom, soaring in flight and loving it, and finally just basking in the late day sunlight and continuing to stretch the beautiful new wings……WOW….. so worth a look to marvel at the beauty of it all! http://www.pbase.com/birdshots/image/150728631 Click “next” in upper right corner to advance frames….enjoy every moment!!! 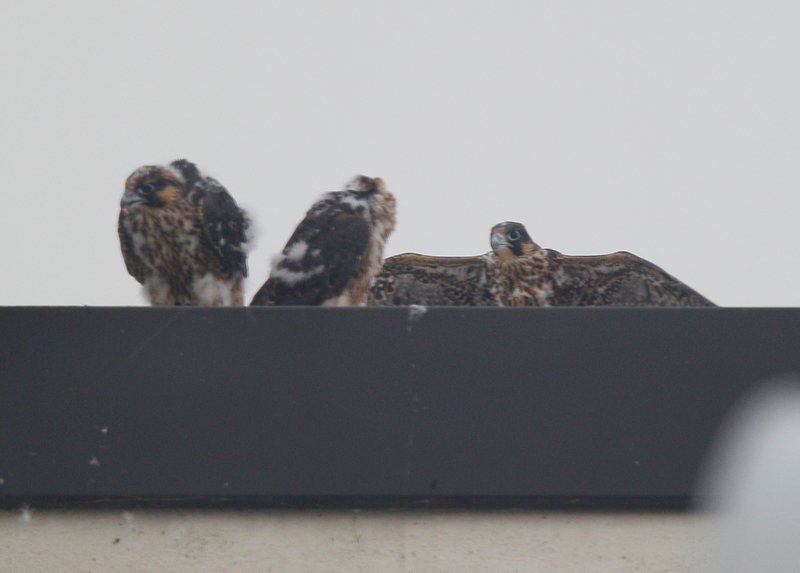 Peregrines in feeding scrum: 3 fledge with one to go! 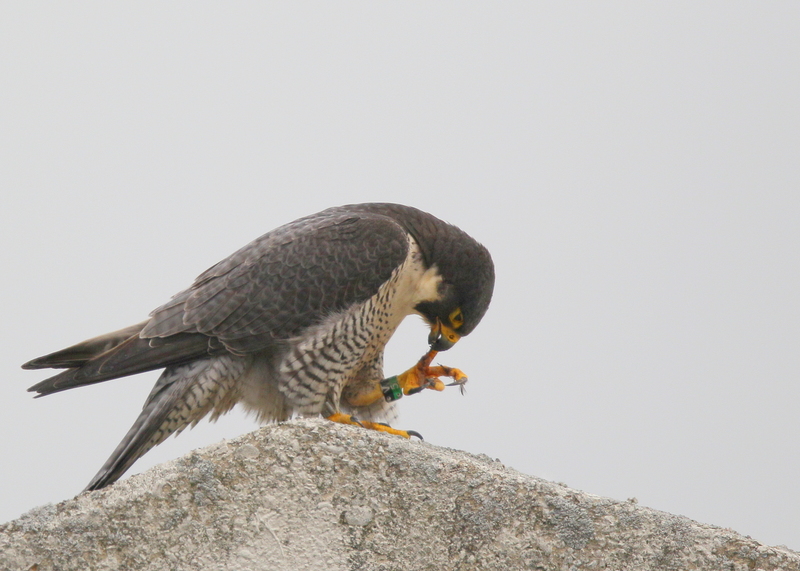 Sunday morning offered beautiful sunshie to watch the four Peregrines chicks. 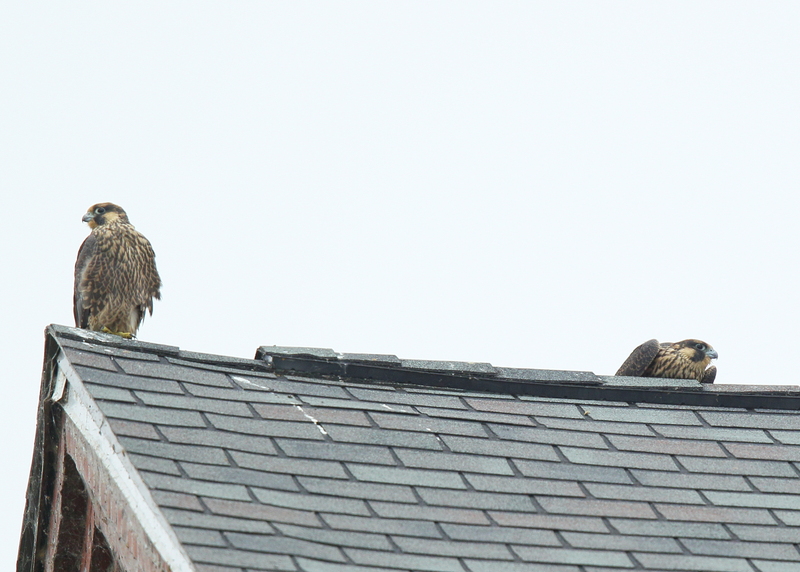 3 of the 4 have fledged and they are all in high energy mode with lots of movement around the nearby rooftops. This team photo remided me of a rugby scrum as all 4 participated in a morning meal. The 4th eyas hopped and fluttered to catch up with others without needing to leave the nestbox roof. According to Birds of North America, within 10 d of first flight, young pursue adults to solicit food. Flight progresses from Butterfly-Flight (1–2 d after first flight) to Flutter-Glide (3–9 d) to Powered Flight (15–25 d). Butterfly-Flight appears to be weaker form of Flutter-Glide associated with in-complete development of flight feathers and pectoral muscles. Pursuits gradually become more sustained and range farther from nest. Adult pursuit is accompanied by begging vocalization. During first 2 wk of flight, young birds’ pursuit of parents takes precedence over most other activities. Young will even pursue parents during territorial defense. 8 morning photos posted including a clear shot of leg bands (11/BD): http://www.pbase.com/birdshots/image/150728584 Click “next” upper right to advance frames….enjoy!! Peregrine chicks have started to fledge! June 6, 2013 in Peregrines at 250 Canal St.
After a short visit to the Great Blue heron rookery in Methuen Wednesday morning, had a chance to also make a brief visit to observe the peregrines. While parked on Mill St. and facing south, one of the peregrine chicks flew by my left side and onto an upper ledge of the white building just below the roof. This is the first fledge flight activity in my observations. Hooray! This morning’s visit was more exciting as one of the chicks was seen on a perch atop a nearby building. Other reports came in during the day indicating some of the other chicks have fledged as well! All great news!! Peregrine chicks on the verge of fledging! June 4, 2013 in Peregrines at 250 Canal St. The Peregrine chicks are on the verge of fledging. The wing flapping is hitting new high levels of activity and at least one of them will fledge in next day or so! Spotted all 4 chicks today and was able to ID at least two sets of leg bands. The leg bands show two digit numbers with two digit letters. In both cases the leg bands are black over green colors. All traces of down are gone at this stage of growth. Terrific series of 20 clear and close photos in excellent light conditions of the 4 peregrines chicks in the final pre-fledge stage of growth! 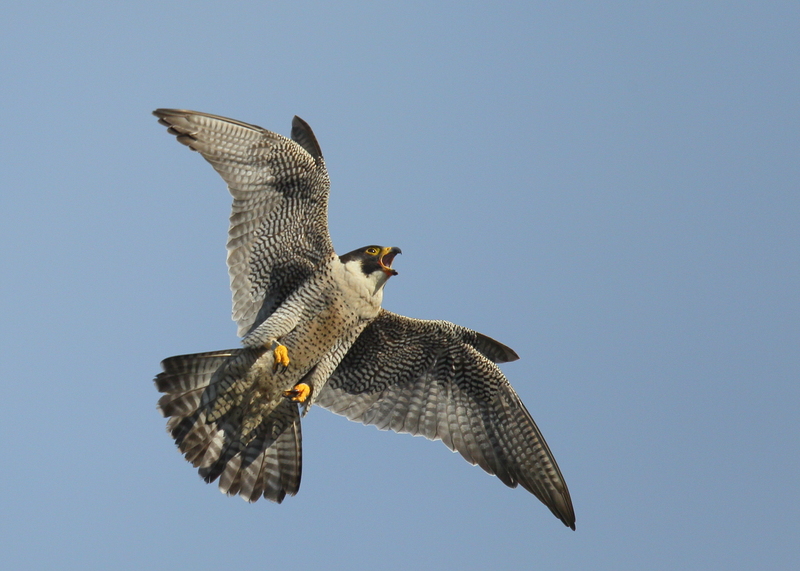 Peregrine Falcon adult female approaching perch! June 3, 2013 in Peregrines at 250 Canal St.
Had a nice opportunity to observe the Peregrines this morning under bright sunny skies. The chicks are flapping about and getting ready to fledge in the next few days. 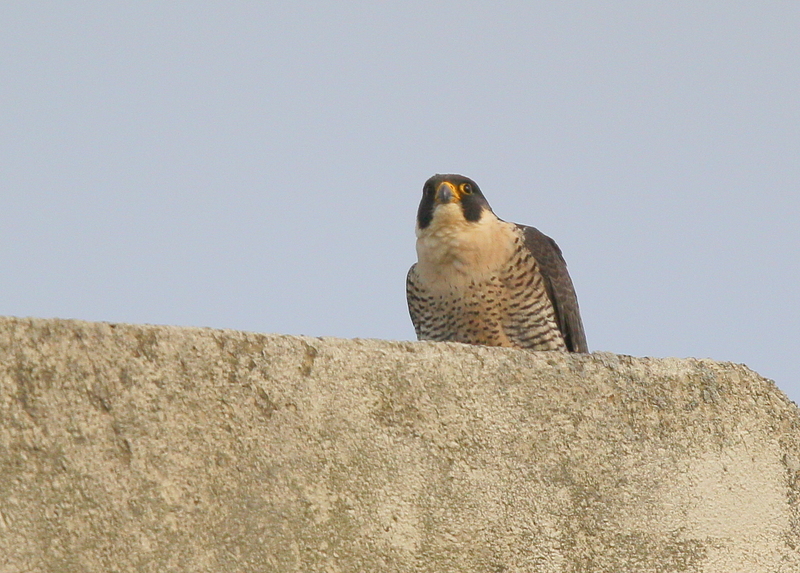 Heard quite a commotion between the adults but only able to see the male atop a building perch. Suddenly, the female came roaring towards the perch screaming loudly and doing so in a way that clearly encouraged the male to move from the perch, so….you guessed it, that he did! 6 beautiful flight shots posted: http://www.pbase.com/birdshots/image/150627451 Click “next” in upper right to advance frames…..enjoy! Peregine chicks in the heat! May 30, 2013 in Peregrines at 250 Canal St.
Summer has arrived for all of us including nestling birds getting ready to fledge! Time to get ready for some good ol fashioned summertime heat & humidity. This was our first time in the low 90s in the Lawrence area since the end of last August and this heat is gonna stick for a few days. In fact, we’ll see afternoon temps near 90 for the next 4 afternoons. All this heat & humidity will be a tesr for our nestling friends. Quite a delight to be able to observe and photo document the new batch of peregrine nestlings as they prepare for first flight. Did you know that falcon chicks are called “eyases”? An eyas is a an unfledged bird; specifically : a nestling hawk. 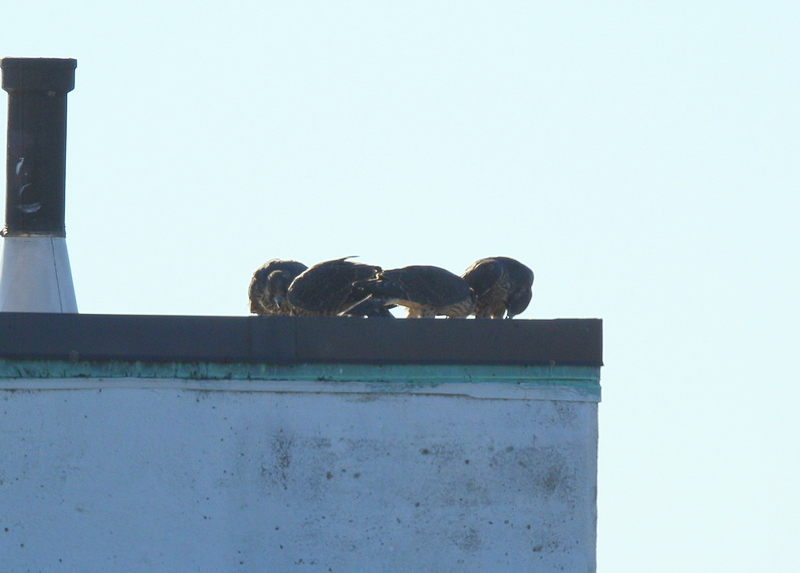 The four peregrine eyases have adjusted quite successfully to their new home on a rooftop after recently being moved by MassWildlife staff. Today provided nice lighting conditions with nice views (from a distance with a scope, binoculars, and a very long camera lens….all from private property) of the nestlings. 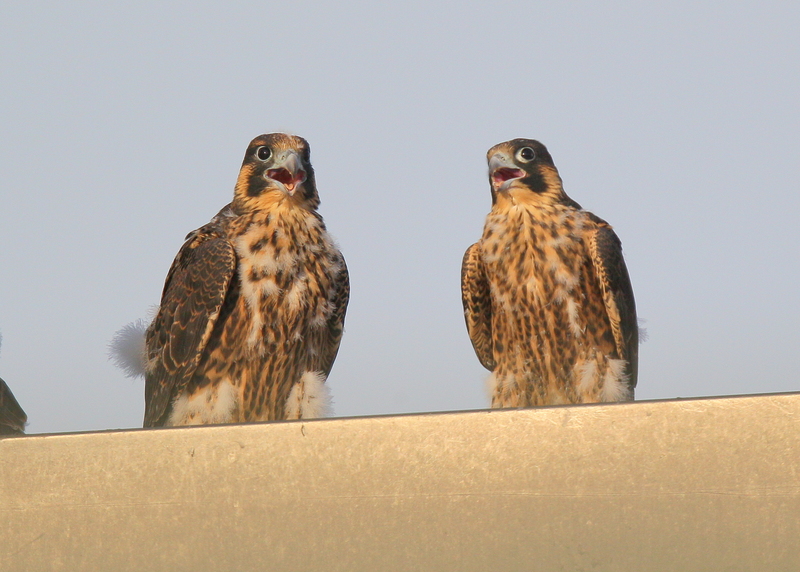 Only able to see three of the four along with terrific views of both parents on separate nearby perches. These photos are well worth a look! 11 Photos of chicks and adults posted: http://www.pbase.com/birdshots/image/150522998 Click “next” in upper right to advance frames….enjoy!! Peregrine Falcon chicks looking around 40 days old! May 29, 2013 in Peregrines at 250 Canal St.
Had a nice opportunity to observe the chicks from a distance under late afternoon overcast skies. They are playful and flapping thier wings in anticipation of fledging soon. According to Birds of North America, at 35 days, while mostly feathered, large conspicuous patches of down around legs, under wings, and on crown. At 40 days, almost fully feathered with traces of down on crown and under wings and outer several remiges; rectrices not fully grown but bird capable of weak flight. With this in mind, these chicks looks close to the 40 day mark and weak flight along the rooftop happens nest! May 21, 2013 in Peregrines at 250 Canal St. The female is on constant lookout over the new nestbox location. The nest box is located on a high out of view rooftop. The perch locations are changing with the new location and time will be needed to determine the mpost grequent and regular new perch locations. 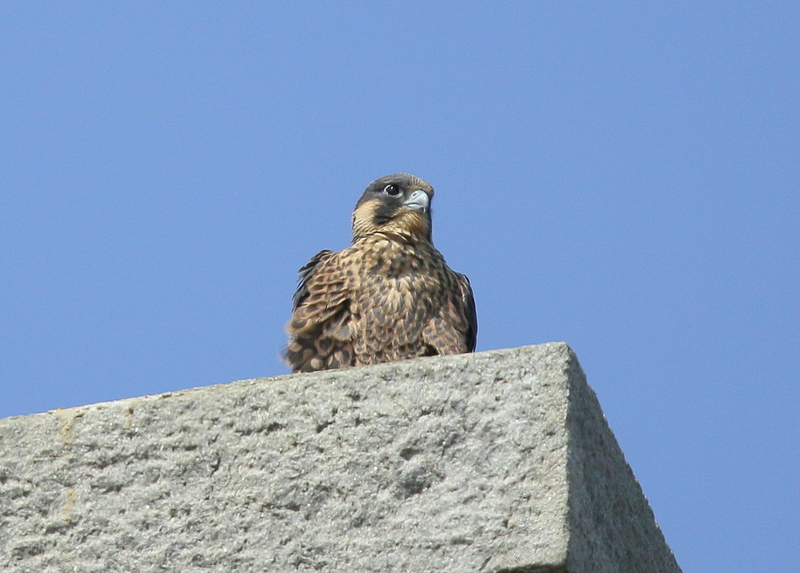 The Peregrines know that the chicks are always at risk to any one of a number of predators and hence a constant vigil is required to maintain safety. Note V/5 leg bands on left leg! 5 photos under overcast skies posted: http://www.pbase.com/birdshots/image/150392499 Click “next” in upper right to advance frames….enjoy! May 20, 2013 in Peregrines at 250 Canal St. The Peregrines are settling very nicely into the new nest box location on a nearby rooftop with a range of excellent nearby perch locations that afford terrific 360 degree views….all seems well for chicks to grow and get stronger!